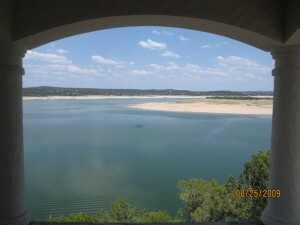 Lake Travis is a wonderful place to spend the weekend for residents all over Austin, Texas. Many of those residents come visit via a long car commute, but what if you had a beautiful custom home on Lake Travis? What if your home was so well integrated with the hillside that indoor and outdoor living space seemingly merges? That’s what you can get with Sterling Custom Homes’ cliff-side home in The Reserve at Lake Travis. This Austin custom homebuilder has taken advantage of every inch of the homes 6,372 square feet and loaded it with luxury finishes and comforts. This home has five bedrooms, five bathrooms and two half baths, perfect for those weekend guests who will want to come play on the lake. This home is perfect for entertaining or gathering with the family. Walls of glass showcase unbelievable views and create harmony between the indoor and outdoor living spaces. The home features dual pocketing Fleetwood sliding glass doors which opens an entire wing of the home to outdoor living areas. This home is priced at $2,998,780 and boasts other features such as diappearing glass walls, 5 car garage, gourmet kitchen, exercise room with meditation court, a vanishing edge pool and more. For more information on this Austin custom home, visit the Sterling website. This entry was posted in Green Design Trends and tagged lake travis new homes, sterling custom homes on July 30, 2010 by Carol Morgan.